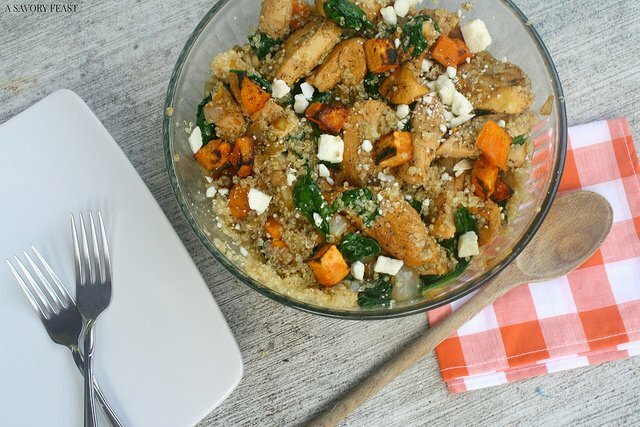 This colorful Sweet Potato & Chicken Quinoa Salad with Feta is easy to whip up for a busy night. It’s light yet filling and healthy yet packed with flavor. 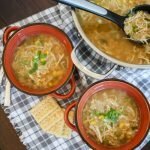 I discovered quinoa a couple years ago and was obsessed for quite awhile! 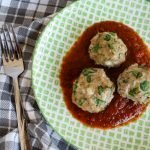 It was during the beginning of my journey to cut back on wheat, so it was a great alternative to pasta. After making the same recipes over and over again, we got a little tired of it. Then, a few months ago a friend made a quinoa salad for dinner. It was amazing! I loved the idea of being able to add some texture and protein to a salad. Sweet potatoes were a must for my first quinoa salad creation. They add a lot of flavor and are good for you, too. I added chicken to make this salad an all-in-one meal. Spinach, onions and feta finish it off perfectly. One of the best things about this quinoa salad is that it tastes great served hot or cold. You can cook it up for dinner and save the leftovers to eat for lunch the next day. You don’t even have to worry about heating them up! 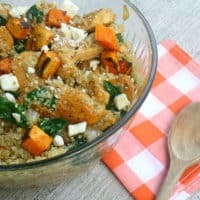 Packed with flavor and texture, this Sweet Potato and Spinach Quinoa Salad with Feta is a healthy dinner that you will love. Preheat oven to 400. 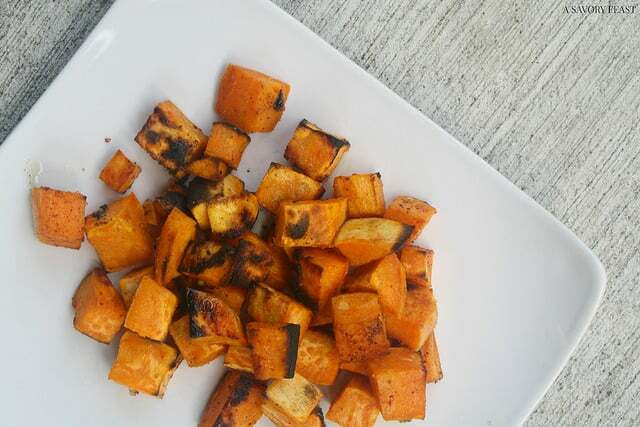 Line a baking sheet with foil and spread the sweet potato cubes in a single layer on the sheet. Drizzle with olive oil and season with salt and pepper. Bake for 20 minutes. Broil on high for 2 minutes or until browned. While the sweet potatoes are baking, prepare the quinoa according to the directions on the package. While the quinoa is cooking, heat the coconut oil in a large skillet on high. Brown the chicken for 2 minutes on each side. Lower the heat to medium high and add the spinach and onions. Cook for 5-7 minutes or until chicken is cooked thoroughly, stirring occasionally. 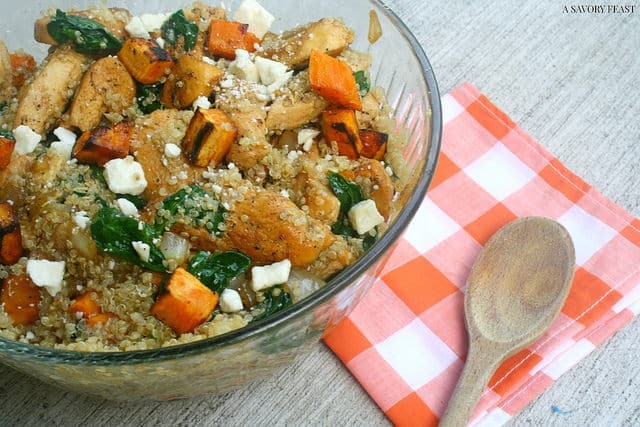 In a large bowl, combine the sweet potatoes, quinoa, chicken, onions and spinach. Be sure to add in all the excess oil from the skillet. Mix until combined. Top with feta. Serve warm or refrigerate and serve cold. Have you tried a quinoa salad yet? What did you put in yours? Love this because it is super healthy! 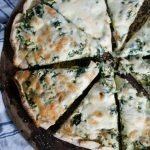 As much as I LOVE it, I would have to leave out the feta for now but this sounds delicious and healthy and I am pinning! I make quinoa dishes ALL THE TIME, and this looks great! I never thought of adding sweet potatoes but what a great addition. I’d sub out some sort of navy bean/chickpea for the chicken or not use another protein source at all – quinoa is a complete protein in and of itself! I also love to add a toasted nut of some sort to add a crunchy texture to the soft quinoa, veggies and cheese. Mmmmm! Seriously, why didn’t I think to use sweet potatoes? Good call! Mmmmm. This looks SO good. For the life of me, I just cannot figure out quinoa. I really need to do some more research. Yum! This looks delicious and I will definitely add it to my rotation. I’ve been making a cold quinoa salad with cucumbers, tomatoes and green onions with a drizzle of lemon. 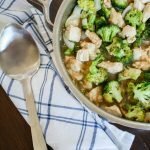 This looks right up my alley and absolutely delicious! What a great Salad, I love the Sweet Potato and Chicken with the Quinoa. Hope you are having a great day and thanks so much for sharing your awesome post with Full Plate Thursday. What a healthy looking salad and great recipe Jenna! Hope to see you on Saturday! I love to combine a bunch of delicious ingredients in one recipe. I hope you enjoy this one! I’m obsessed with sweet potatoes right now, and this looks so good! I am a huge fan of sweet potatoes! 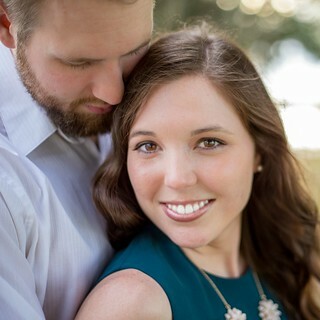 There is so much you can do with them, and they are so good for you. Plus they are filling!